Leaders do often get loaded with the day to day routine whilst other ‘essentials to success’ do get pushed to the side such as the most important values like the ‘company vision’. Where are we heading to…? The Golden Circle is a thought model developed by Simon Sinek. This model is the result of research into the success of the world’s most influential leaders and companies. Sinek found that behind all successful brands lies the same way of thinking, acting, and communicating, which are the complete opposite of how the majority of people think, act, and communicate. When asked why they think their customers chose their company, most companies answer that their customers choose them for their fantastic products or services that are keenly priced and of good quality. Sinek claims this proves that they have no idea why their customers are their customers. Influential companies, on the other hand, let their customer approach be driven by the why question. We will explain this principle in the following using the Golden Circle. The Golden Circle is made up of three circles. 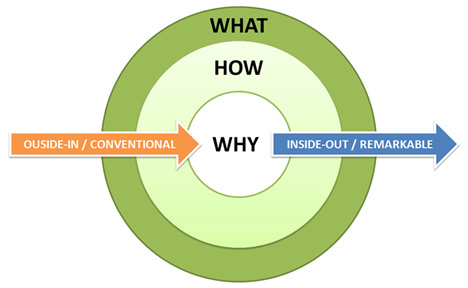 The core is the why, which is followed by the how, and the outer circle represents the what. Most companies start with the outer ring (what), and then work inward (how and why). Only the most influential companies start in the core: why. We will first briefly explain what each circle entails.  What: this is the circle of the products or services a company sells.  How: companies’ explanation of how they do what they do. How can, for example, be a unique sales strategy or a specific differentiating feature. How is often used to explain how something is different or better. Managers tend to think that these are differentiating or motivating factors in consumers’ decision-making process.  Why: this is not about making a profit, but rather about what companies believe in, what drives them. Inspired companies, regardless of their size or industry, think, act, and communicate from the inside out.Sinek uses Apple as an example in explaining his Golden Circle. If Apple were more like most other companies, they would present themselves as a company that makes high-quality computers (what) that look nice and are easy to use (how). They would communicate what they make and how. That would, however, not inspire you as the customer to prefer an Apple product over products by other brands. In reality, Apple starts from the centre of the circle, with the why. They communicate the company’s vision, which is to challenge the status quo by thinking differently. The way they challenge the status quo is by making products with an eye-catching design that are easy to use (how). And those products just happen to be computers (what). The products Apple sells are basically the realisation of their vision.What Sinek tries to press home is that people do not buy your product because of what you do, but rather because of why you do it. In fact, the world’s most influential companies, among which is Apple, do not structurally differ from their competitors. But their customers do think they do. They are so convinced of Apple’s why that they want Apple products more than any other, whatever the cost. That is why a company like Apple keeps going strong as other companies in the same sector topple. These observations not only hold true for companies, they also apply to leaders. Employees who buy into their leader’s why, who share their leader’s convictions, often work harder and with greater commitment. And on top of that, they are much more loyal to their employer than employees of what-driven leaders.Sinek makes a comparison between the Golden Circle and the human brain. The outer circle, i.e. the what, can be likened to the neocortex. This part of the brain is involved in rational and analytical thought and language. The inner two circles correspond to the brain’s limbic system. This part of the brain is responsible for emotions, such as trust and loyalty. It is also responsible for all human behaviour and decision making. The limbic system does not have language capability. When companies start communicating what they do (outside-in), they are appealing to customers’ rational approach. Customers then understand the information they receive, such as facts and figures about the product. But that is not what drives their behaviour. When companies, however, start from the core of the model (why), they are establishing a direct line into the part of the brain where decisions are made. The language part of the brain, housed in the neo- cortex, will subsequently rationalise that decision. This is actually quite difficult to achieve, as these rationalisations end up not matching the actual reason underlying the decision. That makes it hard for companies to adequately tap into people’s emotions when they only target the what. It is therefore better to steer emotions by inspiring people (why) than by manipulating their ratio (what). In summary, it would be advisable for both companies and leaders to focus on the why. It should, however, be noted here that a company will not be able to just invent a reason why their existing product is so great. The why claim must be a true starting point based on which the product is developed. That will allow companies to inspire other people to do things that inspire them. The idea is therefore not to compete with rival parties, but rather with oneself. It is all about the company’s own strength.